When you plan your Disney vacation, the mainstays are attractions, fireworks, character dining and maybe some resort time, but did you know there’s a whole host of other things to do at Walt Disney World?. The Disney World Resorts offer a variety of unique recreational activities that you might not expect to see. Here are a few of our favorite hidden gems. Have you ever wanted to give horseback riding a try? Well, you can on the scenic wooded trails at The Cabins and Campsites at Disney’s Fort Wilderness Resort! No experience is needed. The Cast Member guides and animal caretakers will teach you everything you need to know. 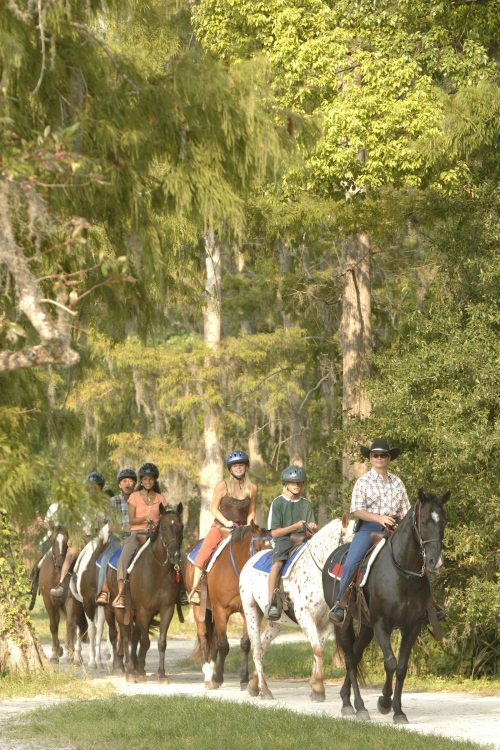 Guests 9 years of age and up can hop in the saddle and ride through serene woodlands that are filled with deer, ducks, armadillos and rabbits and more. The trail rides last 45 minutes and they are a perfectly relaxing way to explore the natural beauty of Disney’s Fort Wilderness Resort. For little ones who aren’t eligible for a horseback riding tour, the Tri-Circle-D Ranch also offers pony rides on petite ponies. Riders aged 2 and up (no more than to 80 lbs and 48 inches tall) can get a taste of being a cowboy or cowgirl at the ranch. Afterward, they may even get to see Cinderella’s Ponies who also live there! Did you know you can go fishing at Walt Disney World? It’s catch-and-release only property-wide, but it’s still a great family bonding activity. There are 2 types of fishing available at Disney. The first is dockside fishing that’s available at Disney’s Port Orleans – Riverside Resort and at Disney’s Fort Wilderness Resort and Campground. You can rent fishing equipment and supplies there as well. The second type of fishing available is guided fishing excursions where you will be fishing for largemouth bass from a boat. You can choose from Guided Bass Fishing Excursions, which includes a 21-foot Sun Tracker pontoon boat that can accommodate up to 5 Guests, and a tournament-style NITRO® bass fishing boat for one or 2 people. You can also choose 2-hour or 4-hour excursions. These tours include a guide, equipment, bait and non-alcoholic beverages. You can go fishing on Bay Lake / Seven Seas Lagoon (by the Magic Kingdom resorts), Village Lake (at Disney Springs), Crescent Lake (at the BoardWalk) or even the World Showcase Lagoon – that’s right, you can fish at Epcot! Now that’s an unexpected experience at Walt Disney World! You have probably heard of the Walt Disney World marathon and the various other RunDisney events held throughout the year, but did you know some resorts have Fun Runs every week? There are currently 5 resorts offering short fun runs (for a $15 fee) as part of the resort recreation activities. Some of them give you a race bib, pin and/or medallion-type finisher medal. The details vary with each one, so check with the resort for the specifics if you are interested. Races start at 7 or 8 AM, depending on the resort, but all are fun and friendly with a distance of 1.5-2 miles. You can find them at Disney’s BoardWalk Inn (Seaside Sprint Fun Run), Disney’s Port Orleans – French Quarter (Beignet Dash – you receive a beignet at the finish line! ), Disney’s Saratoga Springs Resort (Derby Dash), Disney’s Old Key West Resort (The Southernmost Point 3K) and Disney’s All Start Sports – Starting at All Star Movies (All Stars and Icons Fun Run). Space is limited, so make sure to register in advance if you are interested. Each resort’s front desk staff will be able to direct as to how and where to sign up. So, there you have it! 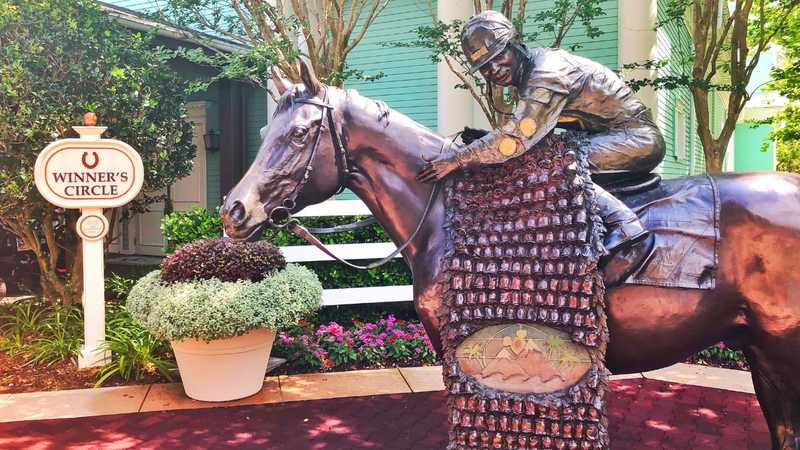 On any given visit to Disney World you have horseback riding, fishing, and racing available to you! Disney definitely offers some unexpected experiences. Have you tried any of these?